Pick a student at random just by giving your device a shake or tapping the screen — but that’s just the beginning. Stick Pick suggests question starters for learners at different levels and also records how well students respond during classroom discussions. If a student is consistently scoring near the top or bottom, simply change the level so students aren’t bored or frustrated. Depending on students’ levels of English proficiency, they might be asked simple yes-or-no questions or to elaborate in longer sentences. Stick Pick is the first app of its kind to uniquely link question stems to the cognitive or linguistic needs of each individual learner. 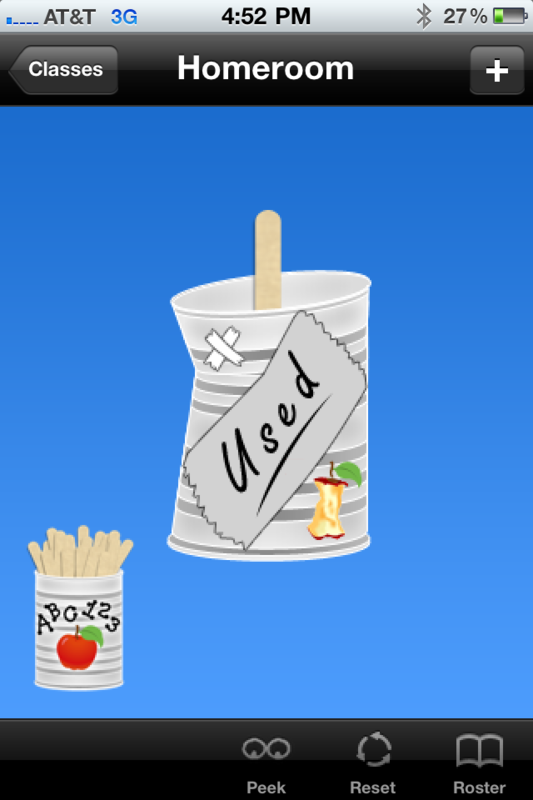 Teachers can have multiple soup cans (classes) filled with sticks (students). During setup, teachers choose a category of question stems they wish to focus on for each learner. Questions can be based on Bloom’s Taxonomy, English as a second language skills, and degree of difficulty can be chosen for each learner. Formative assessment is easy to track because teachers can tap a corresponding correct, incorrect, or opinion button based on the student’s answer. 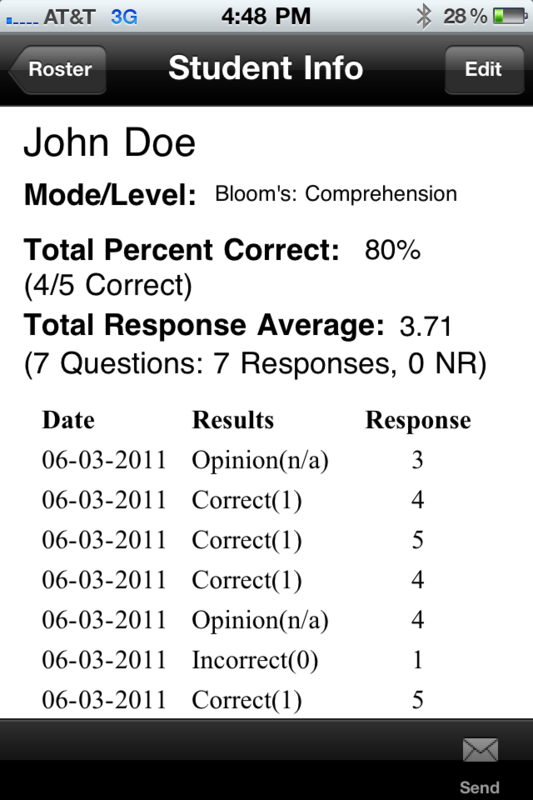 Teachers can also rate each student’s answer by selecting 0-5 on a critical thinking rubric (Bloom’s) or an elaboration rubric (for English as a second language). Stick Pick is a handy tool for any teacher device and can guide classroom discussion and formative assessment in really helpful ways. Teachers can mark sticks so they aren’t constantly calling on the same students or asking students the same questions over and over again. Students in small groups can use Stick Pick too. During small group work, students can take turns asking one another questions based on Bloom’s Taxonomy, making group work more productive and on-task. Finally — no more sticks cluttering your desk! 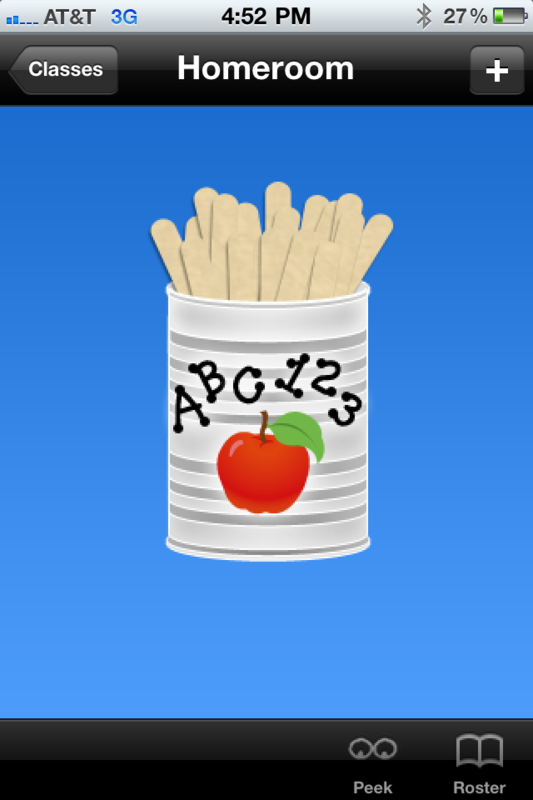 Now you can keep all your students’ sticks in one convenient place: on your mobile device! Standards: Planning for Instruction. Tools: Participation, Writing Objectives. Disciplines: All, Classroom Management. Grades: 3-5, 6-8, High School, Pre K-2. Verbs: Choose, Identify, Leveled Questions, Select. I love this app because it enables me to call on students randomly and ask questions focused on critical thinking and language proficiency levels. I can have multiple classes and groupings so this app works for all grade levels. One feature that is the best, is the ability to reshuffle the sticks. Some students will naturally tune out after being called upon and think they are off the “hook”. However, with the randomizing feature, I can reset the sticks so students do not get complacent. However, the best part is that the students have no idea if I am resetting the sticks or not, so it keeps them on their toes. And, since I am using the app, the students never yell, “You just picked me…” They now yell, “What’s the iPad doing?” Ha, ha.. I find using this app that I think more purposefully about the diverse students needs in my classes. It helps me apply critical thinking questions that go beyond LOTs and move up to HOTs. And, even better, I can also incorporate ELL focused questions based upon their language proficiency levels. Thus, it helps me develop both content and language knowledge! 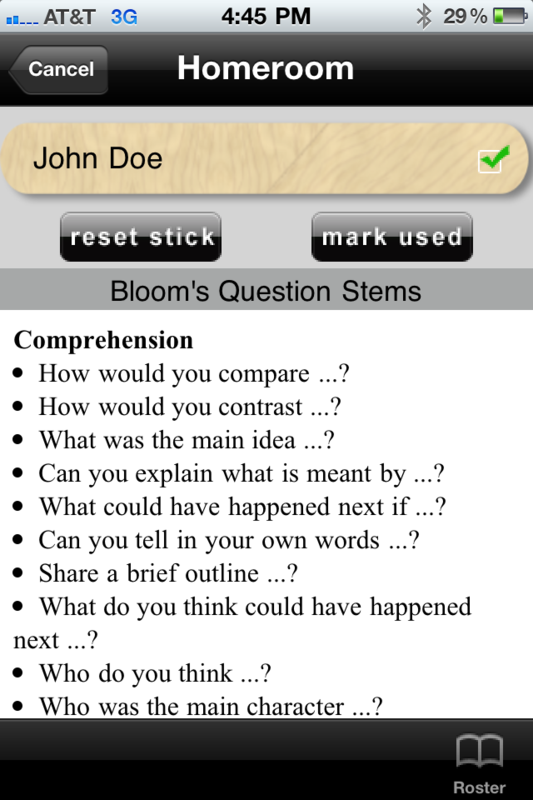 I have to mention, that this app provides the question stems, you have to relate it to the lesson content and activity. However, what a resource! I am a former ESL teacher preparing future teachers to teach ELLs. 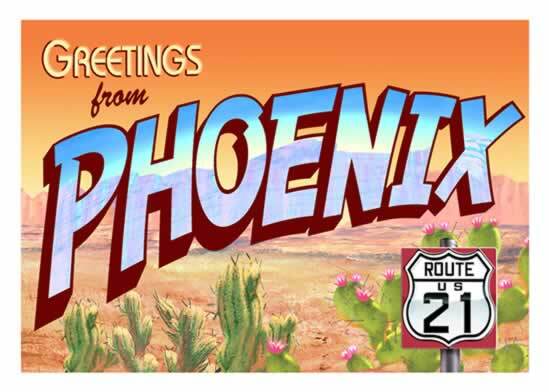 This app rocks! I highly recommend this app. It exceeds expectations by allowing the teacher to indicate student proficiency for the types of questions asked. This is an excellent tool for generating questions while differentiating instruction for students with diverse needs. I HIGHLY recommend this app. Stick Pick is such a neat app! 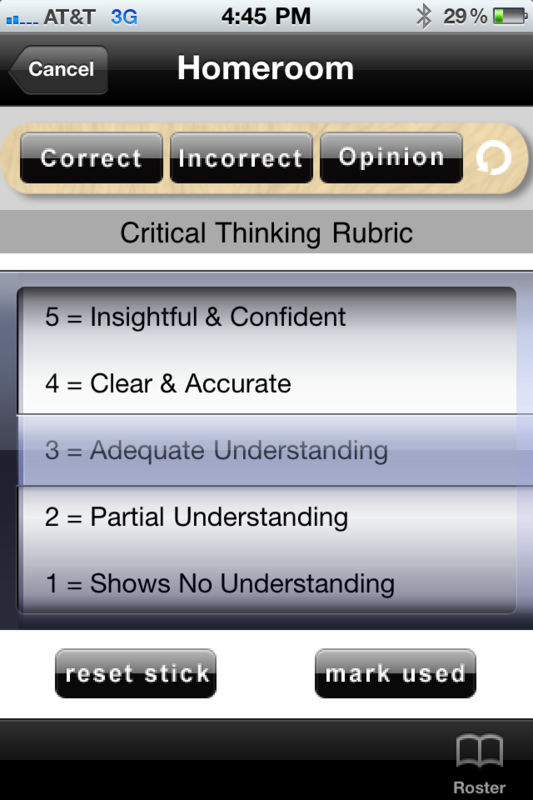 This is a great app that allows you to randomly select students, questions or just using critical thinking. You can do it the old fashion way with real sticks in person, but they can be easily lost…or you can forget them wherever you are. It’s a wonderful idea to use it in an app because it’s always there and it’s always really random. It’s a huge plus that it generates questions too…waht time save and super beneficial to the teacher as well. This app is fantastic for the classroom because I am a neat freak and having one less thing to have in my room makes organization and clean up a breeze. I cant even believe this is an app. It does all the work for you. It saves you time to make every single Popsicle stick and decorate a jar. All you do is submit your children’s names and it does the shuffling for you! Easy breezy… It helped me stay on task in class and kids found it way more fun than the tradition sticks in a can. They were just as impressed as I was.